He was born in Sondrio in 1985. 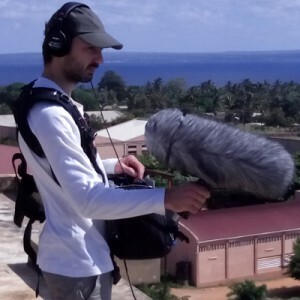 In 2008 he moves to Barcelona where he studies music documentary production at the Observatorio de Cine, immediately channeling much of his attention to the course of real time sound recording held by sound engineer Alejandro Castillo. The following year he returns to Italy and attends a two-year sound engineer course at Scuole Civiche of Milan, course held by Paolo Benvenuti. In 2012 he is boom operator of the short film “Un Pensiero Kalashnikov”( ” A Kalashnikov Thought “), in competition at the Venice Film Festival. In 2013, he is sound engineer of the film “I Corpi Estranei” (“Foreign Bodies”). Besides working for commercials and television programs, he manages the audio of several documentaries, including “Il Rumore della Memoria”, “9 Rounds” and “E Poi C’è Napoli”(“The Noise of Memory”, “9 Rounds” and “And Then There is Naples”).